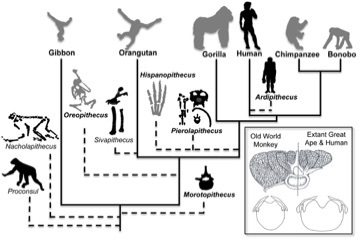 Our lab studies comparative primate and vertebrate evolution, with the main goal to discover the genetic and developmental mechanisms that make us human. My lab is currently working on multiple projects. We are working on a number of projects to uncover developmental mechanisms that underlies the evolution of the human phenotype. Of particular interest is the evolution of the wrist and the loss of the growth plate associated with the mammalian pisiform. We are also working on the evolution of the vertebral column and the role that Hox and other genes have in its patterning. Juvenile chimpanzee pisiforms showing unfused secondary center of ossification. The relative lengths of individual bones are important in dictating the mode of locomotion of a species. Our lab studies how particular growth behaviors are assigned to each growth plate during development. In particular how do certain regions of the skeleton form growth plates while others do not, and why do these regions vary between species? To address this question we are using the natural variation in growth plate formation in the mammalian metatarsal. 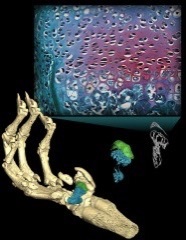 As this bone forms only a single growth plate, we can compare the cellular behaviors, such as proliferation and gene expression, of the growth plate forming and non-forming ends. Differential expression of the Androgen Receptor gene is a key mechanism to mediate the development of secondary sexual characteristics. The wide diversity in male secondary sexual adornments suggests that multiple tissue specific enhancers tightly regulate AR expression. We use a variety of comparative, bioinformatic, and transgenic mouse experiments to identify these enhancers and understand how they pattern particular suites of sexually dimorphic features in humans and primates. Specifically we (in collaboration with our colleagues at Stanford University) have identified a highly conserved mammalian enhancer adjacent to AR that drives gene expression in skin appendages, including sensory whiskers and penile spines. This enhancer has been lost in the human lineage since our divergence from chimpanzees and thus may be linked to the loss of penile spines and sensory whiskers in humans. 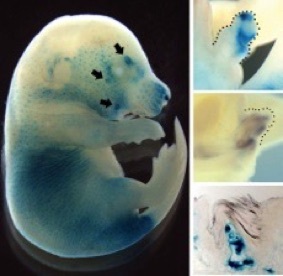 Currently, the lab is working on recreating this deletion in mice, identifying other tissue specific enhancers surrounding the AR genes, and determining the role AR has in the formation of skin appendages such as penile spines. We also engage in a number of more traditional paleoanthropological investigations. Of particular interest is the accurate assessment of the variation due to both inter-individual differences and the uncertainly that results from incomplete specimens in estimates of early hominid morphological characters and the reconstruction of the last common ancestor. So far our research has touched on skeletal dimorphism of Australopithecus afarensis and the evolution of limb proportions across the australopithecine-hominine transition. 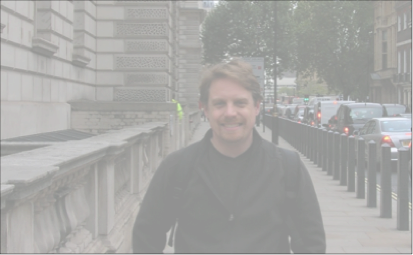 Both projects are currently ongoing as well as newer investigations. We have an open search for a new postdoc!